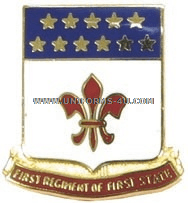 Originally constituted as the 1st Delaware Regiment on 9 December 1775, the 198th Signal Battalion is one of our nation’s oldest military units and might well hold the record for the most reorganizations (28, not counting reorganizations of units with which it consolidated) and redesignations (14). It did not receive its designation as the 198th Signal Battalion until 1970, when the 1st and 2nd Battalions of the 198th Artillery Regiment were consolidated. The Battalion’s most recent deployment came in May 2013 when it was sent to Afghanistan in support of Operation Enduring Freedom; this was the first time in over 150 years that the unit deployed as a full Battalion with Companies A, B, and C in addition to its HQ and HQ Company. For its service between June 2013 and February 2014, the Battalion was honored with a Meritorious Unit Citation, augmenting the MUC it was awarded for its deployment in support of Operation Iraqi Freedom in 2006 – 2007. A red fleur-de-lis in the center of the 198th Signal Battalion’s Distinctive Unit Insignia, or unit crest, represents the organization’s service in France during the Meuse-Argonne offensive in World War I; the white background is the old color of Infantry. Eleven stars (“mullets” in heraldry) stand for the number of campaigns in which the Battalion participated in the Civil War. And the red background on which the motto is inscribed is the old color for Coast Artillery, one of the types of units the Battalion has been designated over the years.